EDWARD ROBINSON says his unique Orion Code trading system is 100% guaranteed way to make profit every day forever. Well… don’t believe a word he says. Edward Robinson is a scam and I am going to prove it in the Orion Code Software review below. Remember, ripping off ordinary people is bread and butter for online scammers – allowing them shamelessly to make a lump sum of cash very quickly. If you don’t want to end up in misery and grief, you must be extra cautions with all these Get Quick Rich promises. Seriously! But let’s dive right into the details and see what you think about this opportunity. My Verdict: The Orion Code is a complete scam. It is a duplicate of the Quantum Code scam and designed solely to defraud and steal your money. Stay away! Although Edward Robinson the Orion Code is 100% deception and ripoff scheme (I am going to prove it to you below) it is fair to at least give a general description of what it promises and how it is supposed to work. So therefore, let me quickly outline its main points for you. Just bear in mind, the whole narrative is fraud. There’s nothing true in it. What Is Edward Robinson the Orion Code About? According to the narrative, the Orion Code is a never-seen-before trading software created by Edward Robinson and his team. The software allows you to trade Binary Options and has 98% winning rate (read my detailed review on how Binary Options trading works). What it’s going to cost you? 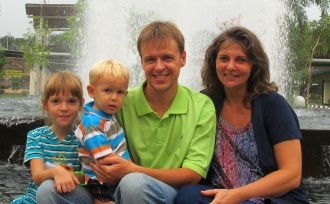 Well, Edward Robinson says that the first 20 beta testers will get his software 100% free. While you get the software for free indeed, it does not mean you can start making money for free. The truth is far from it. Before you can start trading with the software you need to invest your money. First, you must open a new trading account with a Binary Options broker of his choice (it means, you cannot choose the broker). Next, you must fund your account. The minimum deposit is $250 but I have heard that they have raised that bar to $300. Note! Remember, you will use real money, your money, and you can lose it. When you switch the Orion Code system to the Auto-Trade mode, the software will do all the trading for you. All you have left to do is collect money. And because Orion Code has 98% winning rate, it is risk-free investment opportunity. Bear in mind, though, all that is according to their official narrative (we will put it to the test soon). Next, let me list some of their main promises. Seem pretty cool, no? Well, no. None of these promises are true and I am going to prove it to you right now. Keep reading and you will see why. Edward Robinson, the founder of the Orion Code system does not exist. Plain and simple. [Sidebar: Jeff Gorham has played in couple of movies like A Change of Heart, Little Blue Pill, Without Warning, Pogtown, etc. Why on Earth did he choose to ruin his good name and reputation by choosing to join such a vile and deceptive scheme? Just google his name and you will see – he has become a public laughingstock. I mean, how humiliating. If Edward Robinson the genius trader were genuine, there were certainly plenty of digital footprints left behind. However, there are none. Nil. Nada. You can find the same set of testimonials (names, profits, images, etc.) on the Rio Profits, Tesler App, and Orion Code websites. By now it should be as clear as a clear sky that these claims don’t hold water. Tired of scams? Here’s what I use to make money anywhere in the world. Don’t wait another minute to put THIS to work for you. 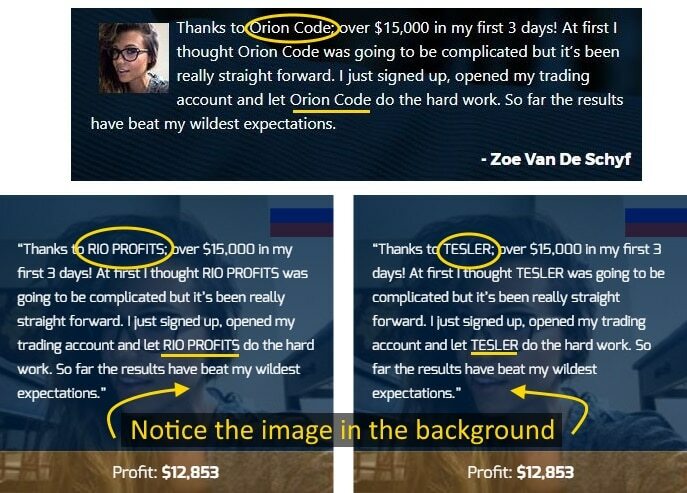 I already showed you that the Orion Code, Rio Profits scam, and Tesler App scam share the same fake testimonials. Er, isn’t it supposed to be the Orion Code Risk Disclaimer? Or did the scammers accidentally spill the beans? Do you think this is the Orion Code app? You might want to think twice. The scammers have taken the easy way and downloaded a free .gif from the internet, then pasted it into their sales page. That’s it. No magic here (no trading app for mobile devices either). The next proof is a real kicker. Enjoy! I have reviewed quite a many scams already but this was the first time I saw anything like this. In fact, it was quite an entertainment. Look closer. The scripts of the Orion Code and Quantum Code are literally identical. Only the places and actors are different. And therefore, they easily prove that both schemes are 100% scams. 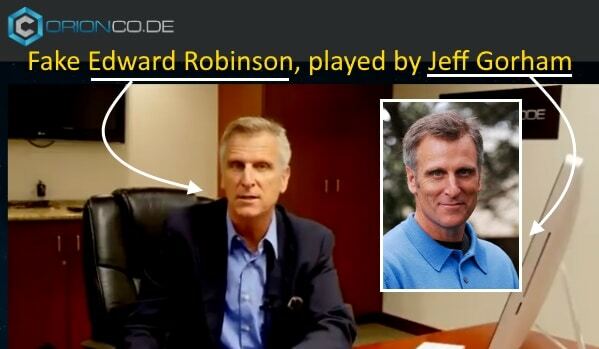 Both narratives follow the same script – Michael Crawford (Quantum Code) and Edward Robinson (Orion Code) fly a similar (rented) private jet to their headquarters. On the way, though, both of them get a message from one of their customers. Is Russia to be blamed for hacking into Michael Crawford’s handphone and stealing Robert’s message… then selling it to David…? Both Edward Robinson and Michael Crawford are very generous indeed. They don’t hide anything and gladly show you their bank account balances. Compare their other data as well. You see! The whole thing is an outright fraud. Towards the end of these two videos, both Edward Robinson (Orion Code) and Michael Crawford (Quantum Code) give you a live proof on how their software perform in real life. For that they create a brand new trading account and deposit initial $250. After that they switch the software to full Auto-trade mode and leave it like that for one hour. Notice that both accounts have an identical user ID (#1075897) while the owners of the accounts are different! Notice also, both men express their excitement with the exact same words! Doesn’t take a genius to spot a dud, right? 5. What version is it? Amazingly, this is exactly what happens with the Quantum Code as well. Is it a coincidence or… are the scam actors just following the pre written movie script? I think it is more the latter. And even though Edward says keep touting, “things that seem too good to be true, sometimes are actually true,” don’t believe a word that comes out of his dirty, cheating mouth. Verdict: Edward Robinson is a scam. The Orion Code is a scam. It is a well oiled rip-off scheme, designed to separate you from your money. Please don’t give your money to these criminals! I did my best to prove that Edward Robinson is a scam but what’s your opinion? 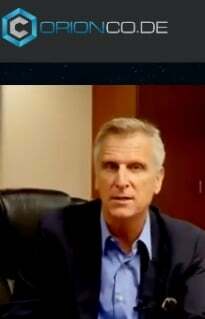 Is Edward Robinson the Orion Code a scam or not? Let me know in the comments, please. What a Review! This is a review which is proven beyond every reasonable doubt. The writer is really doing a great work in exposing such SCAM which is robbing people of their hard-earned money. 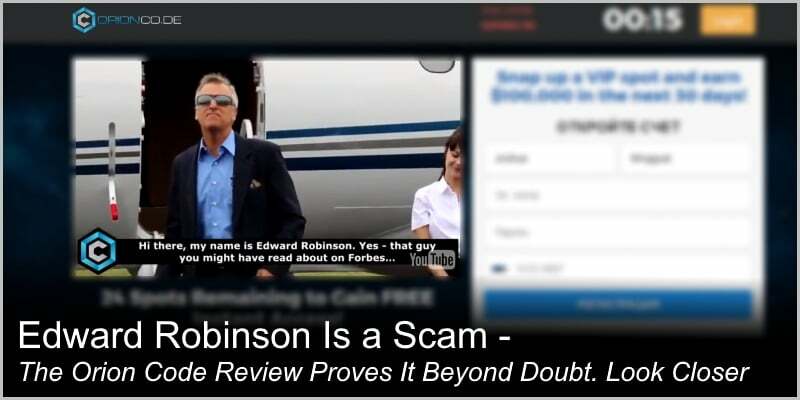 Yes, Edward Robinson is a scam. A definite scam, a Get-quick-rich scheme. No doubt about it. All people understand that to build up an OFFLINE business requires time (often years), investment of money, and tons of hard work. But many seem NOT to understand that building up an ONLINE business requires time and work as well. The positive thing, though, is that in online you can start for free. You don’t need to rent rooms, hire personnel, buy products, etc. So you literally can start for free (or by investing a very small amount of money). But it still requires time and work. Building up a passive income stream online is not a Get-Quick-Rich opportunity. Success won’t happen overnight. But it will happen if one is willing to work toward it. And the best place to start is here. Wow, he doesn’t even let you choose your own broker? Unbelievable!! Thanks for this review, it is so sketchy how far people are willing to go to scam people. This guy fabricates a charactor, and he isn’t even real, I am glad that his reputation as an actor has become ruined due to him trying to scam people. Thanks for your informative review! Hey, Jabob, and thank you for the comment. I appreciate it a lot. To tell the truth, there are tons and tons of scam like the Edward Robinson scam (aka the Orion Code Software). Yes, outwardly they look like saints but look a little closer and that’s just exactly what you will see – lie after lie after miserable lie. There is nothing in their lexicon but deceit. It is just not funny because many innocent people get hammered and milked dry by these shameless con-artists. I am happy when I can protect people from falling victims to these vile schemes. 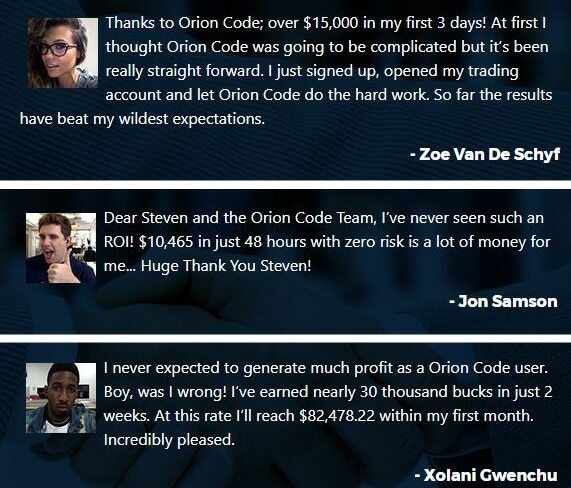 Your The Orion Code Software Review is the best scam review I have ever read seriously! You have so many proofs to demonstrate that it’s a scam that I don’t know if I should laugh or cry. 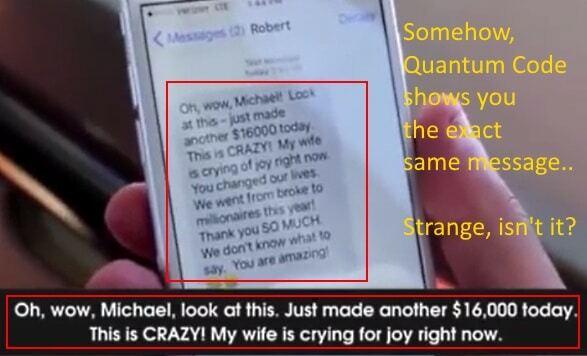 Laugh because it is so ridiculously obvious that Edward Robinson is a scam but cry because before I joined Wealthy Affiliate I did fall for scams like this. And I am sure that there are plenty of people losing their money with Orion Code right now. Thanks to sites like yours it is easier to avoid getting scammed, so big thanks for that! Thank you for the feedback and kind words, Maria. It is encouraging to hear you have found my review helpful. I hope it will protect many from falling into that wicket trap. And truth be told, I have also been scammed and that’s one of the reasons I decided to combat different scam schemes online. There are legit ways to make significant income online. One of them is Wealthy Affiliate, as you mentioned (and one of the best ones, in my humble opinion). The big trouble, though, is that when people are searching for legit ways to make side-money (or full time income online) they stumble across these scammy rip-off schemes. That’s tragic. Thank you again for the feedback, Maria. Well, Egon, this is a new one for me. Hadn’t seen it before. Right away you can see that he wants 25 beta testers. I thought this was a proven system. No need for beta testing. The disclaimer code seems to be the same others use for this type of scam. In fact the more I go through your review, it’s just the same old binary code scam with a different carnival barker. Thanks for the good info …… and the warning. Hey Warren and thanks for the comment. It’s funny, isn’t it. Most of the disclaimer pages of these binary option scams are identical. Only the name of the product is changed. It is heartbreaking to read how unaware people (often desperate ones) get hooked and milked dry by these merciless online pirates. That’s why I keep writing these reviews – to raise awareness about all kinds of online scams. I’ve learnt to not trust any sales material with ‘binary options’ in it. I have read it is unregulated, with no honest brokers, and all the promises are false. You have come across another one, just under a different name. You have done a great job of proving how false this ‘trading industry’ really is. Never invest in anything with ‘binary options’ mentioned! Hi, Greg, and thank you for your feedback. I appreciate it a lot. Seriously, sir! As for ‘binary options,’ I have come to the exact same conclusion. Even though there are regulated brokers as well, the fact is that big majority of them are unregulated and dishonest (as you said). They lure unaware day-traders and promise them the heaven. However, once they are hooked, these con artists milk these poor fellows as long as there is money to be had. I’d like to beat this to people’s head (This may sound a tad violent, but I want to overstate it to make my case): Binary Options are high risk business opportunity and it’s clearly NOT suitable for Average Joe or Jane from the street. Consider Binary Options only when you already are multi-millionaire and are looking ways to burn your cash. And even then there are way better options to do spend your money – like supporting orphanages, different rehab centers, etc. And if somebody is interested in learning on how to make legit side money online, here is by far the best way to do that. Just click here right now and see if they can help you. I have previously been scammed by binary option trading companies so found the information here very interesting. 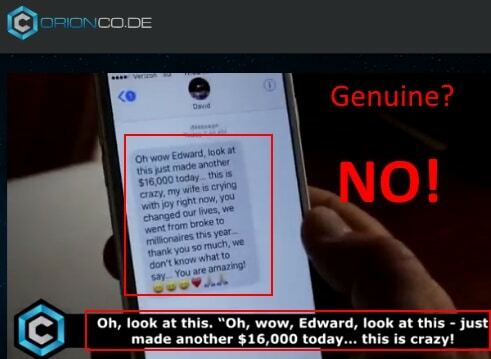 Although I had no intention of getting involved with binary option trading again, it was good to read about Edward Robinson and the Orion Code. The discussion and facts presented were laid out well and served to convincingly deter any visitor from getting taken in by this scam. It was interesting to read about Wealthy Affiliates being a top online business opportunity. Hi, Ann, and thank you for the feedback and kind words. It does not feel great to get scammed, does it? I have also been scammed, although not by binary options frauds. But I know how it feels. I work hard to present facts as clearly as possible – so that I could protect other unaware daytraders from falling victims to these shameless scams and schemes. As for Wealthy Affiliate, this is my #1 choice indeed. I used Wealthy Affiliate certification courses to start making money online. As I wrote in my review, I like it because of their high-quality training, excellent support system, all-inclusive platform (hosting, websites, etc. ), that it’s free to get started, etc. In my humble opinion, it’s just awesome way to learn how create your own legit passive income stream online. Thank you for a very informative post on Edward Robinson. I do not fall for scams and hopefully, never will. That is why I read reviews like yours. I like to see what the scammers are up to. You can imagine if what they promise were true, nearly everyone in the world would be stinking rich. I agree with you. If it is too good to be true, it most probably is. Thank you for spreading the word about these scammers. It is just sad that a lot of people are still falling for it and always will. I have read your review about Wealthy Affiliate. I will always join programs that offer a free option. As soon as I need to provide my credit card details, I will first investigate it thoroughly. I like the idea that there is not a trial period with Wealthy Affiliate and that you can stay a free member for as long as you like. This gives you a chance to check it out first and make sure it is for you. If I get stuck at any point in Wealthy Affiliate, what are the avenues I can take to get support if I need some answers as a free member? Thank you for the comment. Usually I am very cautious as well. However, couple of years ago, I don’t even know how it happened, but I got scammed. Somehow they used a email that looked like it came from the person I trusted. That’s why I was vulnerable (at least I think that was the main reason). Anyway, since then I began to learn how to make legit income online and at the same time – to bust wicked schemes online. Wealthy Affiliate is awesome indeed. All inclusive training platform – just brilliant… I am very happy and satisfied. As for your questions, well, even if you are a free starter members, the support in Wealthy Affiliate is excellent. First, you can use WA “Ask a Question” feature and send your question to the WA community. More often than not, the answers come in within minutes. Second, even though you cannot use WA Private Messaging, you still can drop your questions to other WA members profile pages, blog posts, trainings, etc. They will answer you (often other WA members answer as well). As for me, all my questions, 100% have got answered. As I said, WA support excellent. Kyle and Carson, the founders of WA have worked very hard to make turn WA support as efficient as possible. Great review article on Edward Robinson. I have heard many things about him and everything has been bad. It was good to see that my intuition wasn’t bad. Your article has really opened up my eyes to him and his scams. I also read your article about Wealthy Affiliate and I think it is a fantastic product. I will definitely give it a try! Hi, Shawn, and thank you for the feedback. Also, I am glad to hear you found my review helpful. Wealthy Affiliate is a genuine training platform indeed. Give it a try and see whether it can help you. It won’t cost you penny to see if it’s for you or not. As for me, I have found Wealthy Affiliate extremely beneficial. Even if you go Premium, think about it – their price $49 a month includes state of the art hosting + excellent training, support, etc. In other places you pay only for hosting. Here you get so much more. Seriously! Plus, and that’s the best part of it – their Starter membership is completely free. Look closer.